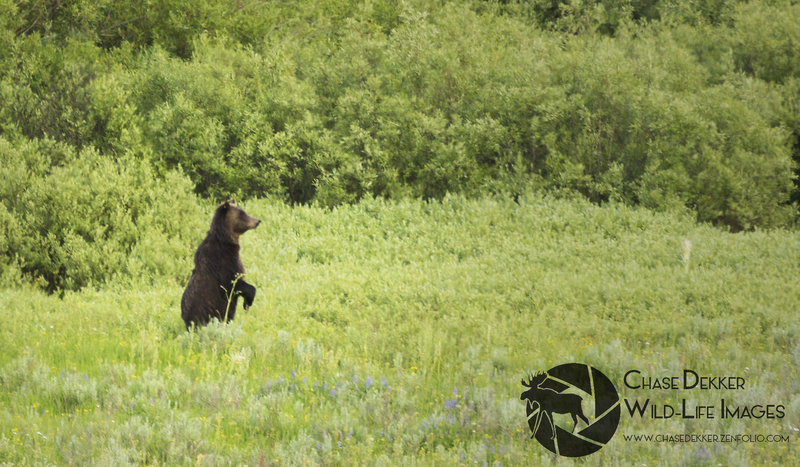 Jackson Hole Wildlife Film Festival: Our Blog has MOVED! – Page 3 – Find our NEW blog at http://www.jhfestival.org/blog! “All the world’s a stage,” according to Shakespeare. But “life is not a dress rehearsal,” says author Rose Tremain. Creating theater for politicians, as I did at my first job on Capitol Hill to setting the stage for TEDx speakers, my latest passion, has been a fun way to learn about journalism. In between, I got my Master’s in Journalism. I quickly burnt out on police corruption and market moving stories. I took a break to raise two kids – the most challenging yet rewarding job I’ve ever had – and I changed my perspective. 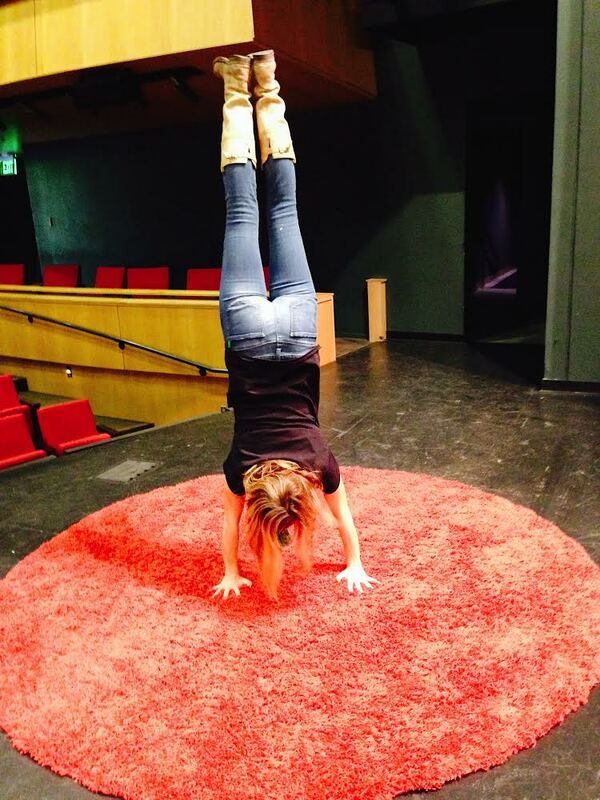 So I got involved with TEDx because I believe TED talks are some of the best journalism out there. An authentic voice and an idea worth sharing speaks for itself. Make it personal, emotional and relevant, I told Carly Mitchell, the last speaker I worked with. Follow the 10 TED Commandments, a guideline I also used when I substitute taught at The Start Up Institute here in Jackson Hole to help students write their elevator pitch. While some of her earlier drafts were obtuse and ostracizing, in the end Carly unified her audience with her brutal honesty and sense humor. I can’t take much credit for that, except for making her go to a yoga class with me. It was the TEDly messages which raised the bar for Carly and for me. We all want world peace and harmony. The question is, what are we going to do with our one short life to help move in that direction? My TEDly answer is to honor myself, surround myself with people who inspire me and challenge the status quo with the kind of leadership that comes from behind. “If you want to make peace with your enemy, you have to work with your enemy. Then he becomes your partner,” said Nelson Mandela. Listening to the news, which seems to be hyper focused on gay marriage and Ebola these days, can make us angry and fearful. But the personal nature of TED talks often creates a relationship to current events that is educational, uplifting, and looks for solutions rather than placing blame. So I choose to go to TED and now TEDx rather than the nightly news, and I think I sleep better at night. The days of Polaroids and darkroom photo development have been replaced by the modern era of digital ubiquity. Photography apps have risen in popularity among smartphone owners, as users are now able to take, store, and send pictures from one device. The Snapchat app is a particularly pervasive example. Indicative of the times, the name of this app is a quippy hybrid: “snap” morphs with “chat” to imply a short exchange, quick as a shutter speed. But what’s the point? Why not use real cameras? What’s the allure of Snapchat? Allow me to explain. Let’s assume you are on a white water rafting trip and pull your raft up onto the bank of the river. The lighting is magnificent, the rapids are terrifying but magnetic, and you realize this experience MUST be shared. You whip out your phone, open the Snapchat app, and take a picture. Assuming all of your friends also have Snapchat, you can send them this picture. However, the app gives you the ability to set a time limit for the number of seconds for which the photo will appear on your friends’ phones. If they click on the picture but are not paying attention for the six-second time limit you have set for it, they cannot reopen it! This scene before you — the mesmerizing dance of swaying trees and violent rapids — will go unappreciated by all but you unless your friends are paying attention for those six seconds you allow them. 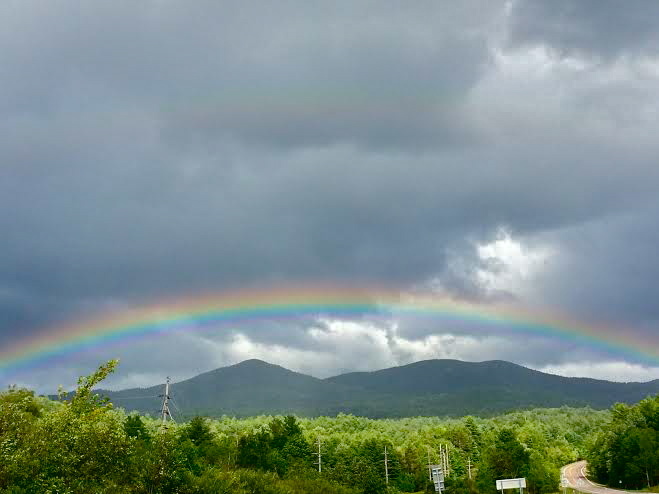 This view is worth more than any pot of gold. And yes, there are two rainbows. Taken via Snapchat in upstate NY, on the road between Elizabethtown and Westport. So the question remains: what’s the point? What consequences do your friends incur from this experiential time limit? On the one hand, Snapchat limits one’s exposure to nature. Your friends only have six seconds to see and process the picture you send. This is no way to experience the wild! A six-second photograph can’t convey the triumph of the water’s strength as it shapes the riverbanks, nor does it hint at the ravenous sound of the falls in the distance, nor the lulling scent of sun-warmed balsam firs lining the shore. And then there’s you. Does looking through a lens put distance between you and your object of focus? Snapchat differs from ordinary digital and film cameras in that it is a form of social media; you are sending this picture to specific recipients. In all likelihood you are anticipating their reactions, allowing those to color your own immediate experience. We all know this feeling: it is difficult to be fully present when we are sending an email or a last-minute text. This is why there are hands-free laws and those omnipresent signs that read, “No Phones Please!” Snapchat, too, can be a distraction. Like many other kinds of social media, it prevents full absorption of one’s surroundings as one attempts to send time-limited photos and videos to one’s entire social sphere. On the other hand, Snapchat could be portraying nature realistically: wilderness is something fleeting, rare, and valuable. One must be present and attentive when one is exposed to it. Snapchat enforces this reality, disallowing prolonged exposure to the precious vistas, permitting just a hint of sublimity. That human desire to have more of something after just a brief taste could encourage further rafting excursions and thus increased wilderness education. This is good: the more that people know about the natural world, the better we will be at protecting it. Additionally, as the Snapchat photographer, you are forcing yourself to view the scene piecemeal. 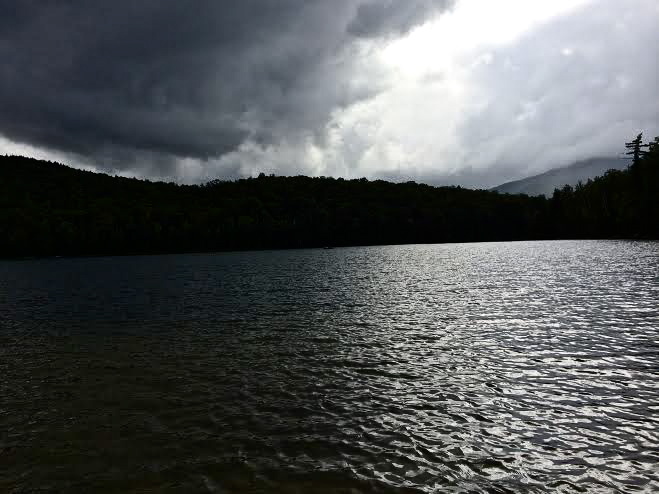 The grander scope of the roaring water, the glaring sun, and the threat of hidden boulders has a tendency to overwhelm, and the limited parameters of your smartphone’s screen may allow you to process the vista more thoroughly, and to cherish it. It is controversial whether or not Snapchat’s cons outweigh its pros. 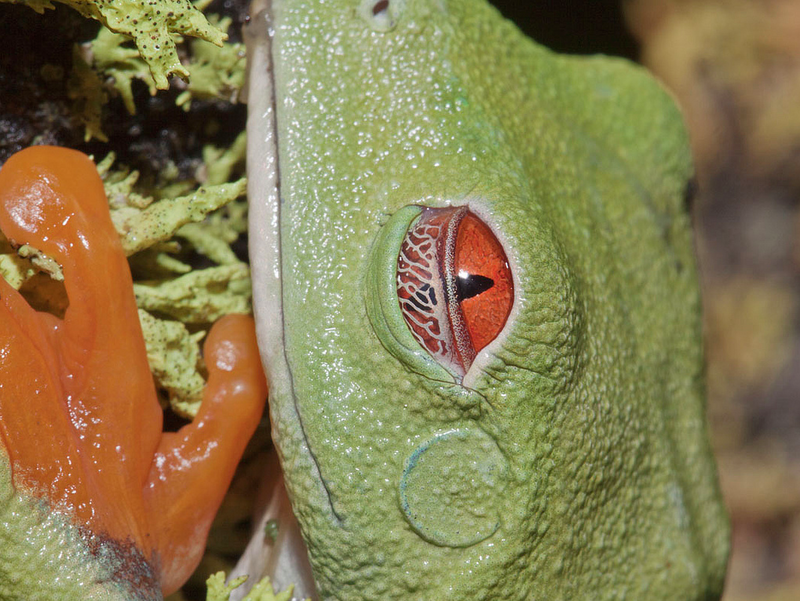 Long-form nature film, on the other hand, is widely accepted as a comprehensive representation of the wilderness. It educates the masses on the value of the wild, combining cinematography with narration to tell the history of a place. If individuals are inadvertently educating their peers about this history through apps like Snapchat, the primary consequence will be increased awareness. Is this deleterious? As you stand on the riverbank, taking a photograph and sending it off to your social sphere, you are neither mentally nor emotionally present. But imagine the good that could be done if your friends are paying attention when they open the photo! They are introduced to a world of dynamic beauty and sublime ferocity, if only for six seconds. I’ve tried to find an imperfection in this view and I simply cannot. 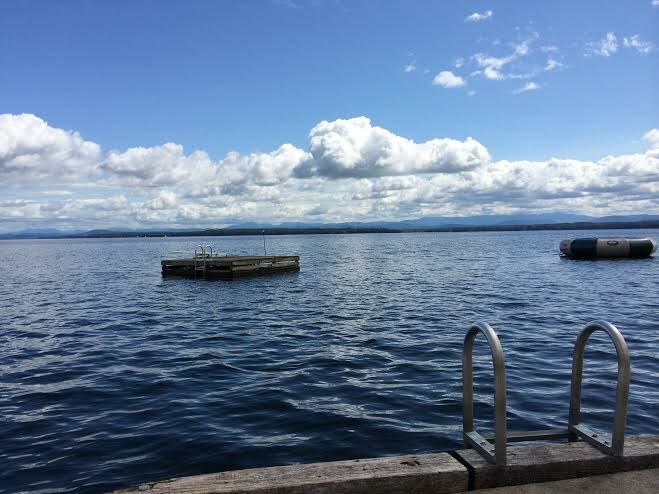 Lake Champlain has never looked so good. Documented by Snapchat in Westport, NY. Sitting on a school bus, chatting with a 12-year old, and struggling to slide the window down on a sunny day. That’s how my day started with Jackson Hole Middle School’s summer program students. 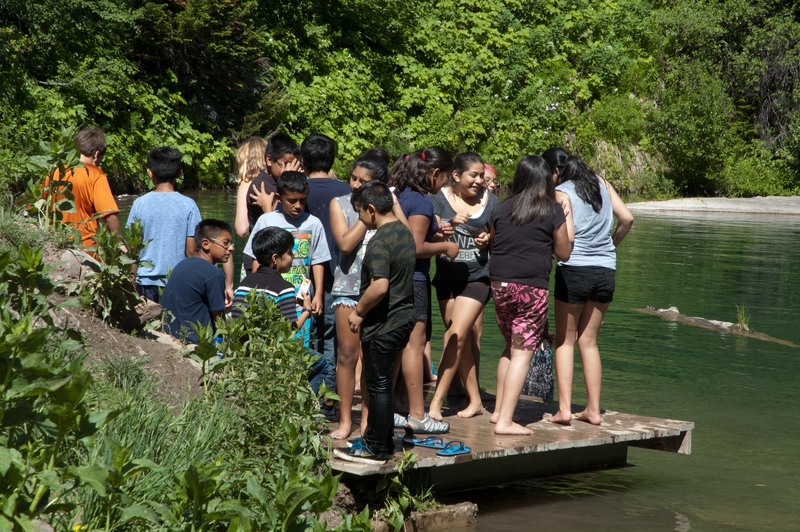 We were on our way to hike to Crater Lake, documenting our adventure through the picturesque landscape with cameras, as well as recording wildlife through scientific observation and data collection. This was the fifth year that the festival provided cameras and guidance to students, who combined art and creativity with their outdoor experience. I was pumped to be able to spend my day as a nature photographer. Who hasn’t dreamed of the uncertainty and thrills of day-to-day life that characterize the career of a professional photographer. Imagine the adrenaline of tracking down a tiger in India and observing its behavior, chasing a sunset on a Fijian beach, or witnessing a wolf pack track and hunt an elk in the Hayden Valley of Yellowstone. Photos of such natural phenomena spark my own curiosity of the world, and they tell stories that are magical in ways that words cannot be. The pinnacle of our day as nature photographers was jumping into Crater Lake! Who’s going to jump? Jackson Hole Middle School summer program at Crater Lake. 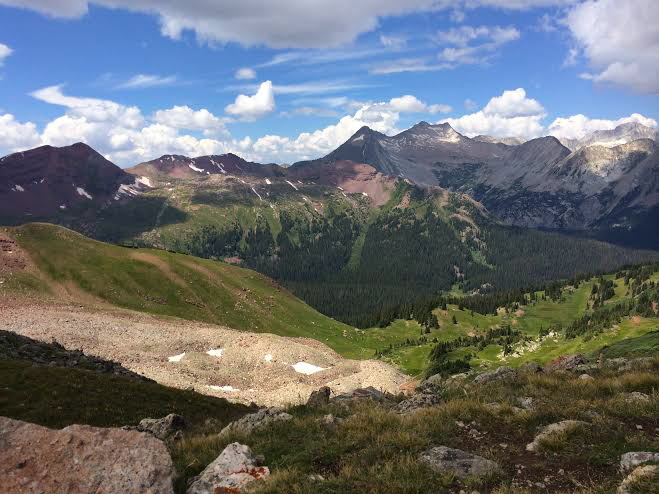 The perspective of the lens prompted the students to perceive their backyard in a new fashion, and the pictures allowed them to share the story of their hike with friends and family. Once they learned to edit pictures via Photoshop, and picked their favorite one, the photo was entered into the Teton County Fair. 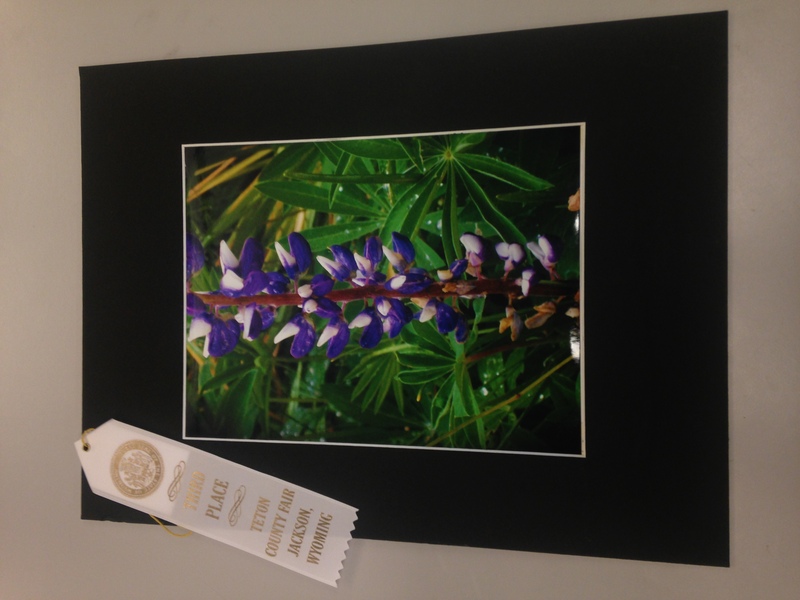 Motivated by the chance to take home a first place ribbon, the students were careful to observe the surrounding vegetation, exhilarated when a butterfly fluttered near them as they clicked the shutter button feverishly to get the shot. 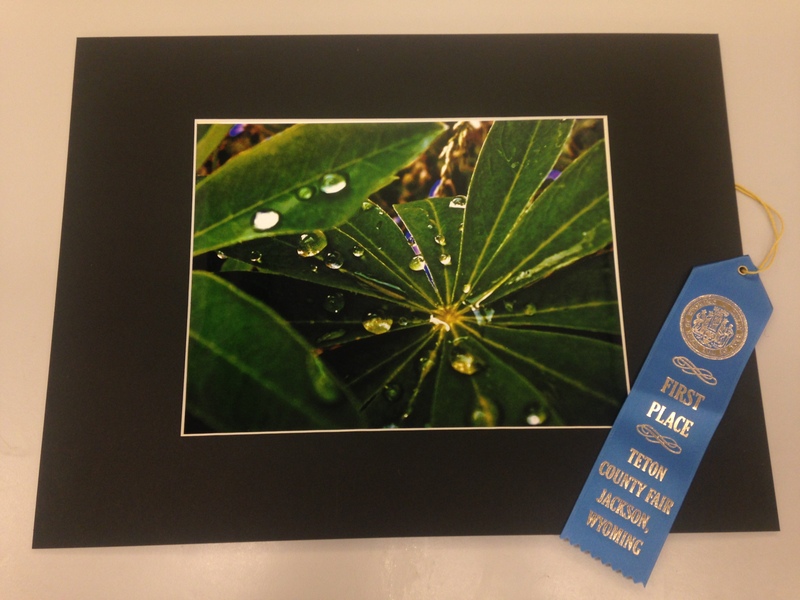 First place ribbon was awarded to this 13-year old photographer. “It was purple and big” got a third place ribbon in the 12-year old and under division. This year, we were lucky to have the guidance of two Nature Mappers. With their help, and a topographic map and identification sheet of common animal species in the area, we collected data on the wildlife we saw. This was the first time that youth were involved with this Teton County-wide citizen science project. These initiatives, that allow non-professionally trained scientists to contribute to research, foster scientific engagement in the community. 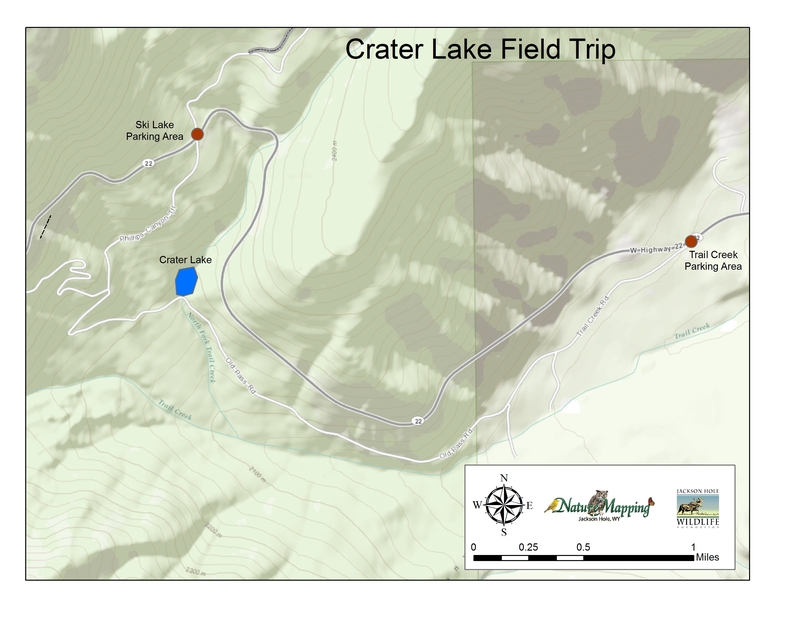 Topographic map used to identify the exact location of wildlife sightings during the Crater Lake Field Trip. 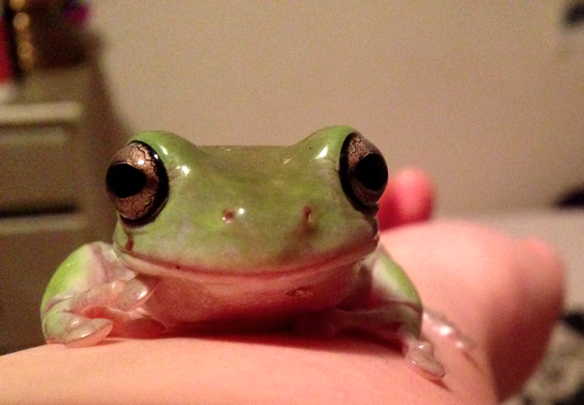 This type of field-based work, that the students got to participate in, is my favorite part of science. 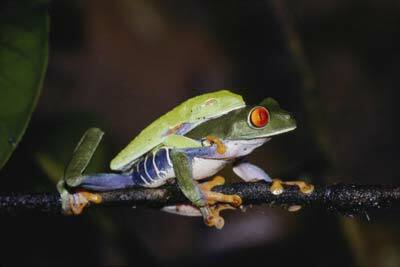 During my ‘Field Studies in Biodiversity’ course in Ecuador, the intimate involvement in the process of gaining new knowledge was thrilling, and let me realize my passion for wildlife. 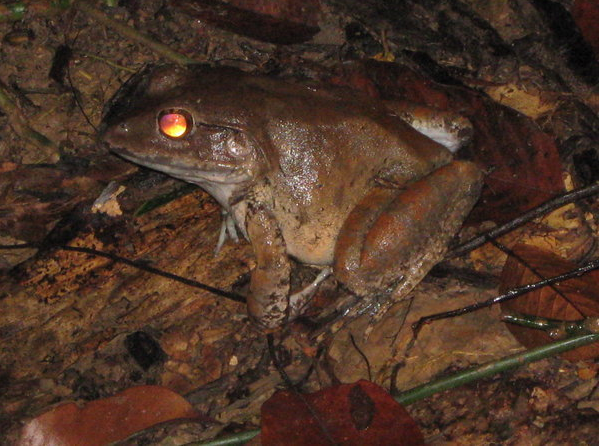 Completing work in a lab would never compete with the experience I had studying in the vibrant rainforest ecosystem. Just as my class had let me experience both science and the outdoors in a different way, this July day was spent working up a sweat while contributing to our knowledge of the local ecosystem. Jackson Hole Middle School students and other citizen scientists contribute to long-term data that is used by scientists and the government to inform policy that favors wildlife sustainability. The youth Nature Mappers contributed scientific data that will make a difference in their community, which I hope inspired them to be more engaged with the wildlife in their backyards! I was enthused by the transformation I witnessed, from middle school students into keen observers and masterful photographers. 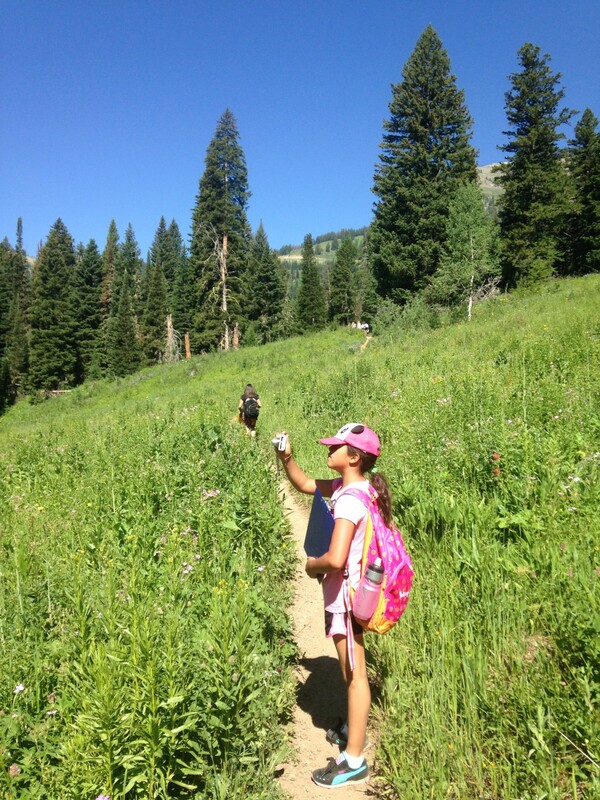 Perhaps one of them will be competing in the Jackson Hole Wildlife Film Festival someday, or they simply realized they wanted to go on more hikes. Either way, this day allowed for nature to reveal its mysteries and magnificence, which will encourage lifelong respect for the natural world. 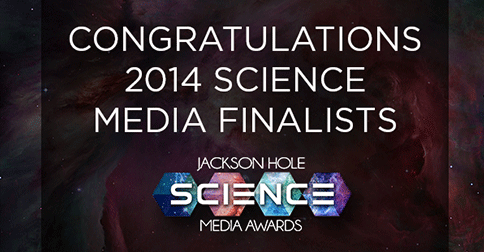 2014 Science Media Finalists Announced! Living in Jackson, WY has its perks, with the biggest being the abundance of outdoor activities at close hand. My favorite activity is searching the quietest corners of Grand Teton National Park for wildlife and whatever else I might find. Grand Teton plays host to many of North America’s charismatic species such as moose, elk, bison, wolves, and bears: black and grizzly. The other day, I was driving up an isolated road in the North section of the park and wasn’t having much luck finding anything. When I was tired and about ready to give up as the sun was just about to set over the Teton Range, I noticed a mother moose run out of the willows with twin calves in tow. I hadn’t yet seen a moose calf since my arrival in Jackson a week prior, so this was a real treat. I got out of the car to get a better look when they started to run for the road. This is when I noticed they weren’t running because of me. 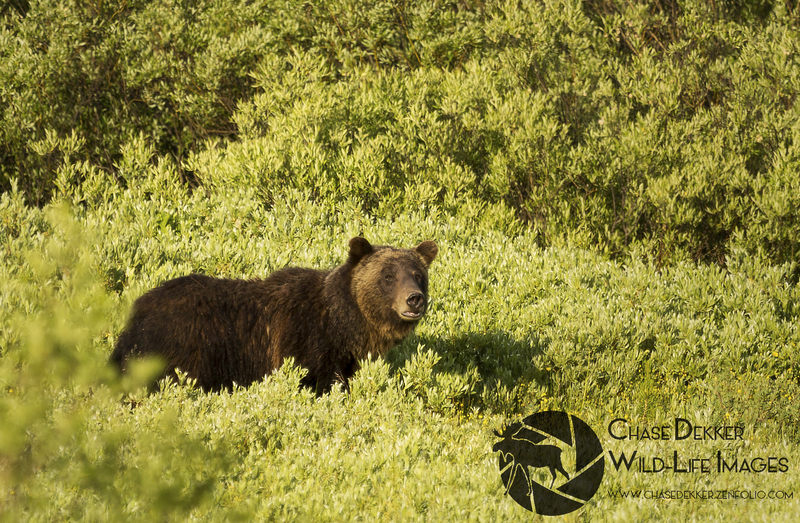 Only about 150 feet away a grizzly bear tore through the willows and stood up on its legs to get a better look. I was ecstatic that I was watching a grizzly bear hunt. The moose ran across the road and the bear continued to pursue the group. I pulled my car forward, parallel of the bear and it looked as though he became a bit distracted, which allowed the moose to get safely over the flowered meadow hill and out of sight. The bear looked as though it was not in any mood to waste much more energy chasing them and began to walk around only 60 feet from my car looked for another source of food. I watched the bear dig up roots and sniff around for over 10 minutes before it vanished into the forest. I have been searching since for this bear but have not found him or her since, but I’m hopeful the bear will show its face again soon. When going out looking for wildlife, it is always important to not only be aware of what’s out there, but respect it as well. These animals, such as bears and moose, are extremely dangerous and could kill a person without even trying. It is a joy though, however, to find and see them in their natural habitat, and the biggest advice I have is to go out during dawn and dusk and to know where to look. 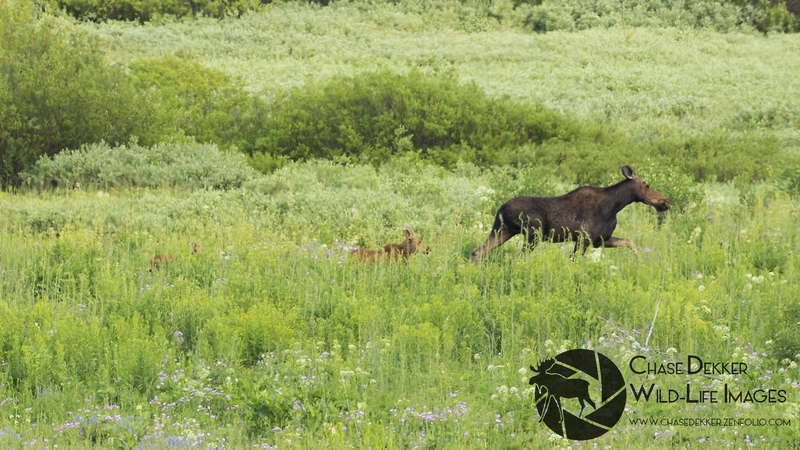 For example, moose like swampy and willowy areas and bears like more open meadows and willows as well, so it will raise your chances to look in the spots the animals frequent instead of aimlessly driving around. However, most of wildlife watching is pure luck. I’ve had experiences where a bear walks across the road and is only visible for 10 seconds and if I was just 20 seconds later to the scene, I would have never seen it. So don’t get discouraged if you don’t find anything at first! The more you put yourself out there, the more you’ll see, and that’s a guarantee!